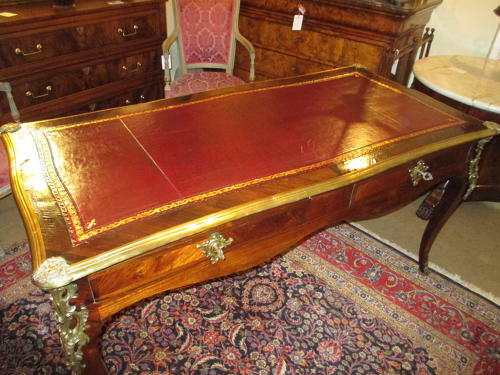 A large rosewood and mahogany bureau plat, with two large drawers to one side and blind drawers to the other, so can be used in the centre of a room if required. In the Louis XV style with good quality large bronze mounts, new tooled leather to the top just fitted. Excellent condition and very nice quality. always difficult to source writing tables of these large proportions. Measuring 59"wide by 29.5"deep by 30" high. dating to the mid 19th Century.